There’s no shortage of opportunities for great fishing adventures in Minnesota. Whether you’re off to a small farm pond you’ve always been curious about or taking a snowmobile deep into some backwoods lake in the winter to hunt down giant crappies, adventure abounds. Winter has its grip clenched tightly, and most waters are covered in ice. Ice-fishing is a staple in Minnesota, as is Lake of the Woods. There’s no doubt that Lake of the Woods is one of the best walleye fisheries on the planet, and January is one of the busiest months for the gigantic body of water. The daytime bite here is incredible for walleyes using a variety of techniques, but you’ll be hard-pressed to find a shanty without a gold ice jig and a minnow set up below a bobber. Don’t overlook the opportunities for giant perch, record-class burbot, abundant tullibees and giant crappies. All these fish call Lake of the Woods home, and all are attainable in good numbers in early January. Oh, did I mention the number of 20-pound pike also swimming around in Lake of the Woods? Other Options: Mississippi River Panfish: The Mississippi backwaters can be stellar for panfish through the ice. Use caution with any body of water with current though. Look at the areas near Wabasha for some of the best spots. Burntside Lake Trout: Burntside Lake near Ely is a great spot to hit up the lake trout opener in Minnesota. One of Minnesota’s most beautiful lakes to snowmobile on, Burntside is home to some excellent lake trout fishing. Leech Lake could realistically be plugged in anywhere on this list, but with Eelpout Festival taking place in February, it needs to be touched on. Any lake than can draw 10,000 people in below-zero temps needs to be talked about. 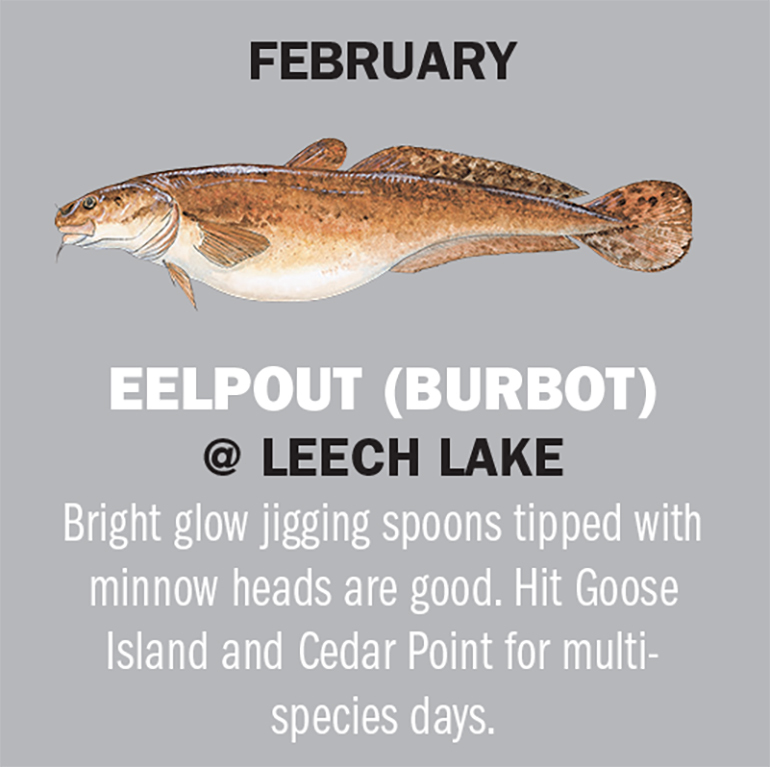 In the summer, Leech is known for its muskies and walleyes, but in February the eelpout takes the reigns. 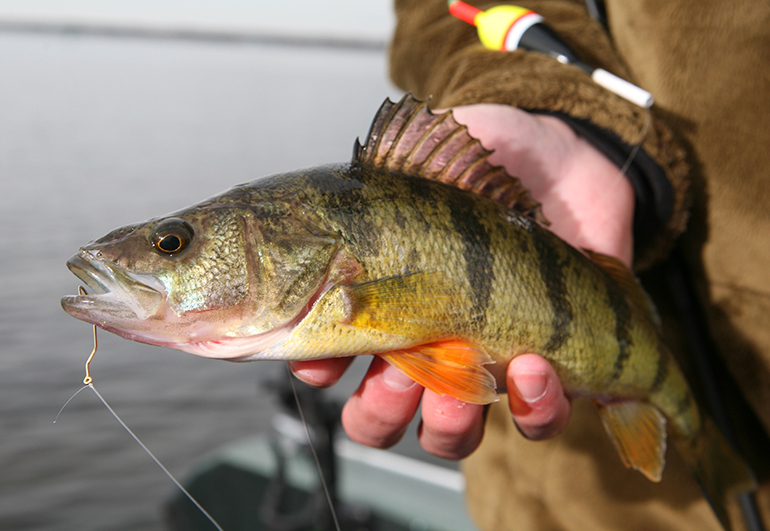 Don’t overlook the amazing perch and walleye fishing either, and in late-February the panfishing heats up as well. There’s also a great population of lake whitefish and tullibees for the angler that loves the chase of these smoker-friendly fish. Leech Lake is a truly diverse fishery. Other options: Little Cut Foot Sioux Panfish: Little Cut Foot Sioux is a great panfishing destination. Close to Lake Winnie, Cut Foot provides anglers visiting the area a chance to chase panfish to break up their trip. Lake Osakis Panfish: Lake Osakis is a favorite amongst panfish enthusiasts across the state. During the mid-winter doldrums, Osakis keeps kicking out fish. Pool 4 near Redwing, MN is one of the most recognized walleye factories in the state, and March is a great time to chase white-tips and sauger there. 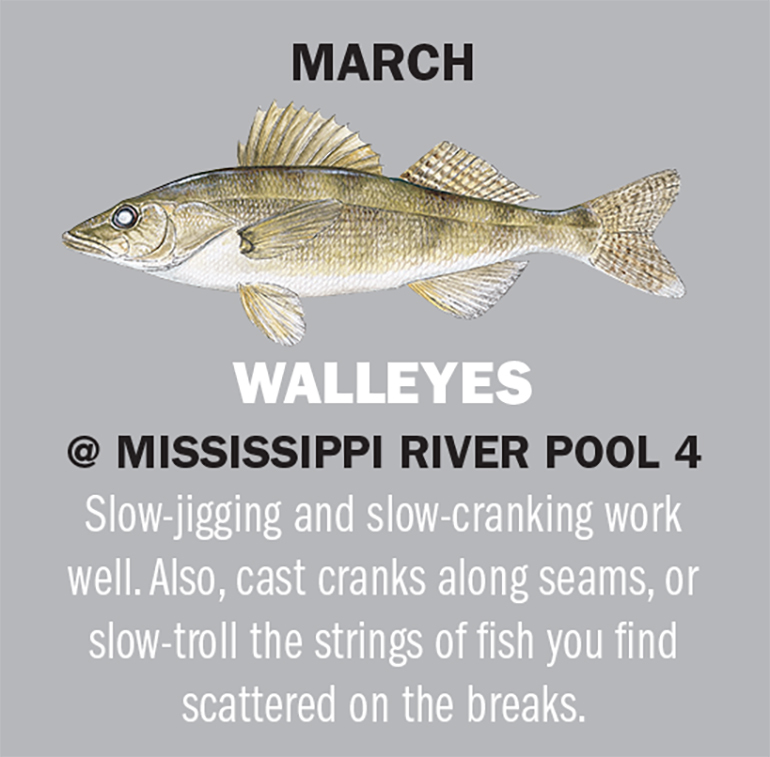 It’s no secret to any walleye diehard that the Mississippi River in March on Pool 4 is the place to be. After a long winter, anglers get restless and crave time in the boat. March walleye fishing provides an early start to a summer full of hooksets. The amazing thing about Pool 4 in my eyes is the size of the sauger. There are 23-inch-plus sauger caught every spring, and it’s a great place to check the elusive saugeye off the bucket list. All of that great fishing is seated against some of Minnesota’s most beautiful scenery. Other Options: Lake Superior Rainbow Trout: No list is complete without a Lake Superior mention. Kamloops begin to run up the tributaries from Lake Superior and are an absolute blast. Wear good boots; the rocks can be very slick. Horseshoe Chain of Lakes Catfish: Horseshoe Chain of Lakes near St. Cloud puts out huge numbers of catfish through the ice. It’s a fun trip, and one everyone should experience. Good panfishing can be had on the Chain as well. One word is on the mind of most anglers in Minnesota in April: Rainy. The Rainy River bordering Minnesota and Canada is one of the top fishing destinations in the state. From Baudette to International Falls, the stretch of river is home to one of the strongest walleye runs in the country. Every time you slide your boat into the Rainy River, the chance at a 30-inch walleye is there. Drifting with the current while jigging a 3/8-ounce jig tipped with a Moxi Minnow or a rainbow chub is usually a good bet. White, gold and pink are the colors of choice. Working the seams with crankbaits can also produce big fish. 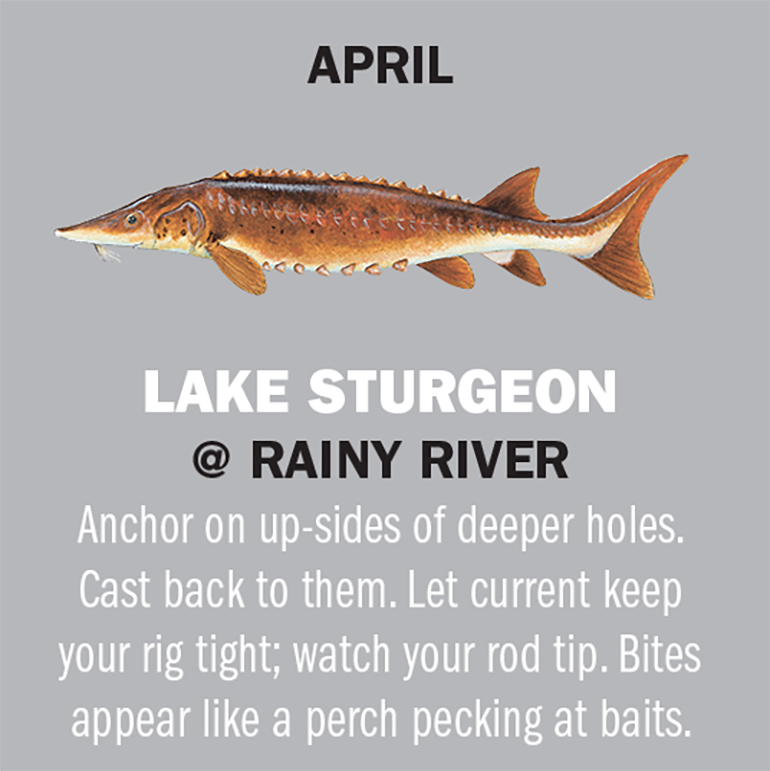 Don’t forget to pack along some big gear as well, as the mighty lake sturgeon also runs upriver to spawn in April. A glob of crawlers placed on a circle hook 12 to 16 inches behind a 3-ounce no-roll sinker is all you really need for your best chance at success. Anchor up, and wait for the arm burn because when you hook into a fish older than you are, you can bet that they won’t give up without a serious fight. Other Options: Big Stone Lake Walleyes: Big Stone Lake along the Minnesota/South Dakota border is a great walleye destination in mid-April. Lake Minnetonka: Ice-out crappies on Lake Minnetonka cannot be overlooked. Shallow weed flats and bays hold big numbers once the ice melts. Otter Tail Lake is fast becoming a destination lake. Not only does Otter Tail have some great walleye fishing, but the sturgeon stocking efforts made by the Minnesota DNR have really paid off. Size and numbers of both walleyes and sturgeon are solid in the fishery, and both can be had in May. Don’t overlook the panfish in one of the hundreds of lakes in Otter Tail County either. The options there are virtually endless. Other Options: Lake Andrusia Walleyes: Lake Andrusia is a walleye heaven around the opener. Jigging spottail shiners on the shorelines is a proven tactic. Big Sandy Lake Panfish: Don’t forget about panfish just because walleye season opens in May, and look no further than Big Sandy Lake near Aitkin County. A border water takes the cake for me when June rolls around. The Red River bordering Minnesota and North Dakota is home to the best channel catfishing in our state. Arguably, it’s one of the best catfishing destinations in the country. The banks of the Mighty Red have a beauty all their own, with flood lines and mudslides that are mysterious and full of wonder. The deadfalls and cuts in the banks hold cats, suckers, goldeyes and the occasional walleye. Other Options: Shagawa Lake Mixed Bag: Shagawa Lake near Ely is gorgeous in June and is a great multi-species destination for campers and people who like to get off the beaten path. Lake Bemidji Variety: Lake Bemidji in June is tough to beat. Big numbers of natural walleyes, a good abundance of jumbo perch and pike and giant muskies make Bemidji more than a pass-through town. Lake Mille Lacs could fall anywhere on this list, but when other lakes are starting to feel the heat and start slowing down, Mille Lacs just keeps on kicking. The sheer number of walleyes in the “picture worthy” category makes Mille Lacs a “must-fish” lake. If you prefer other species or get sick of 19- to 28-inch walleyes, you can fish one of the top smallmouth fisheries on the planet. Mid-lake rocks hold giant numbers of huge smallmouth bass, and during the July heat up, the smallie fishing is downright silly. Don’t forget about the largemouth in Mille Lacs either, or the big northern pike, or the muskies for that matter. Albeit controversial, Mille Lacs is undeniably one of the best destinations that appears on this list. Other Options: Cedar Lake Mixed Bag: Cedar Lake is just a skip and a jump from Mille Lacs, and it holds good numbers of bass, muskies and is an excellent panfishing destination. Lake Itasca Mishmash: Lake Itasca is a sleeper lake, but it definitely deserves mention. Muskies, walleyes, panfish and all of the beauty of Lake Itasca State Park are alluring. Don’t forget to visit the Mississippi Headwaters while you’re there. Lake Winnibigoshish, or Big Winnie to most anglers, is a powerhouse for walleyes throughout the year. Once known for its large perch, Winnie has quickly become one of the best walleye lakes in the state. It was once a hotspot for anglers year-round but fell off in the late ’90s; it has bounced back with a vengeance. Fish of 20 to 26 inches are becoming the norm, but eaters can be had with some sorting. Finding fish isn’t going to be an issue for most; it’s finding the right size. Other Options: White Bear Lake Walleyes and Muskies: Anglers wanting to stick near the Metro can look no further than White Bear Lake. A great walleye and muskie fishery, White Bear stays busy year-round. Lake Louise Hodgepodge: Over 40 species of fish swim the waters of Lake Louise State Park. Anglers wanting to cast a line in a gorgeous stream can look to the park as well. It’s pretty tough to beat a trip to Rainy Lake in the fall. Excellent walleye, pike, smallmouth bass and crappie fishing have made Rainy famous, but the scenery when the leaves begin to change is what keeps people coming back each year. Rainy Lake has something for just about everyone, including hunters, who can hunt grouse and deer in the surrounding forests. Bays, reefs, basins… you name it, Rainy has it. Good numbers and big sizes lurk in the stained waters of Rainy Lake, so bring a big net and your camera. Don’t skip a trip to see the stone mermaid on the famed Rainy Lake. Things like that add to its allure. Other Options: Cass Lake Walleyes, Muskies: Cass Lake heats up as the temps start to fall. Excellent walleye and muskie fishing can be had in September on this gorgeous lake in north-central Minnesota. Pokegama Lake Walleyes: Walleyes are putting on their winter fat, and in Pokegama the walleyes are downright plump once fall rolls around each year. A 30-inch fish isn’t impossible, and a 6-pound smallmouth isn’t out of reach either. Gull Lake in Brainerd is one of the best lakes to fish in the fall. Big walleyes that elude many anglers throughout the summer finally show themselves and are vulnerable in October. Rigging redtail chubs or light sucker minnows is a proven fall tactic. If largemouth bass are more your forte and you enjoy deep jig-worm fishing, Gull is your place. With a pile of water to cover, look to the points and mid-lake structures, and don’t be afraid to fish deep. Using 10-inch power worms in 30 feet of water can put out some serious largies. Other Options: Trout Run Creek Rainbows: Trout Run Creek in Fillmore County is stocked with rainbow trout throughout the fall. This provides a beautiful fishing experience that should be on everyone’s list. Visit the National Trout Center in Preston while you’re nearby. 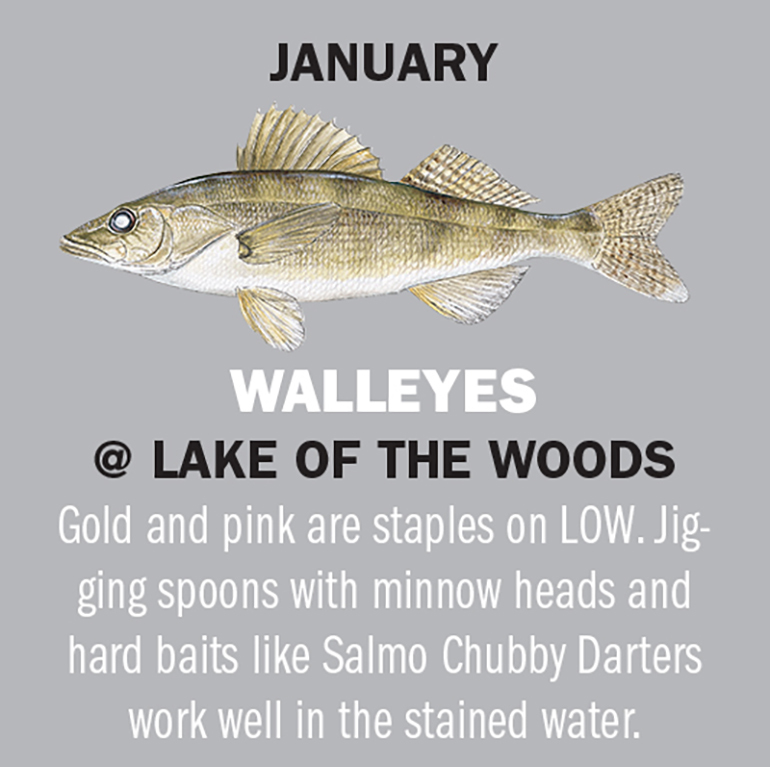 Madison Lake Walleyes: A walleye sleeper that can really turn on in the fall is Madison Lake near Mankato. For many years, it’s been a late-fall producer. When fall is starting to look like winter, everything with gills starts to bite really well. Bass are no exception, and some of the best bass fishing in the fall can be found on Lake Tetonka. Whether you’re after largemouth, smallmouth or the ever-angry white bass, Tetonka’s 1,300 acres has them all. Once the producer of a state-record largemouth, Tetonka still puts out trophy-class bass every fall. Other Options: Diamond Lake Crappies: Diamond Lake in Kandiyohi County is a great lake to put big numbers of fall crappies in the boat. With huge quantities of 9-inch and larger crappies, Diamond definitely should not be overlooked. Look in the deep basins to find schools of hungry fish. Lake Pepin Saugers: Another walleye factory that continually puts out huge saugers is Lake Pepin. The biggest fish of the year can be found chasing river-run minnows in November. Look for big bellies on Pepin’s stretch of the Mississippi. Upper Red Lake is one of Minnesota’s largest lakes; it’s also one of the state’s most featureless. Upper Red is basically a bowl full of walleyes. There are subtle changes, and a few bars to note, but shoreline structure is key, and the way the ice forms cannot be overlooked as “structure” either. Heaves and patches of cloudy ice can hold schools in a featureless lake, and Red Lake is notorious for it. Red Lake’s resurgence is incredible, and the abundance of walleyes in the system is staggering. More anglers flock to the area in late-November and December than anywhere else in the state, and that’s for good reason. The walleyes bite with reckless abandon. If you’re lucky, you might even bump into one of the notorious 2-pound crappies swimming around. Other Options: Pelican Lake Panfish: Pelican Lake near Ashby, Minnesota, is a great early ice lake, where bluegills, white crappies and black crappies can be had in good numbers and with decent size. The walleye fishing on Pelican is also good at early ice. Lake Minnewaska Walleyes: Lake Minnewaska produces fish year ’round, but early ice walleye fishing can be quite good on this Pope County lake.